Forever immortalized in the United States Capitol is one of the great “oopsies” of the British Empire. Following a bout of ridiculously good luck for the American colonists, the British surrendered at Yorktown in 1781 which virtually guaranteed American independence. Four years later, artist and 18th-century super-spy John Trumbull found himself afflicted with a need to paint the American revolution like Rose Bukater in Titanic. This new found hobby would lead Trumbull to create several paintings on the subject including two versions of this specific surrender. Deciding he wanted to draw oddly expressive horses and incredibly bored humans, Trumbull began to thoroughly research the events of this battle to depict them with accuracy; taking almost a year just to determine the placement of the figures within a smaller 20 x 30 inch draft. Having decided the perfect layout for his creation, only one small problem remained: Trumbull was unable to attend both the Surrender of Yorktown (which is depicted) and the massive kegger that must have followed (which is not depicted). This meant he had absolutely no idea what many of the individuals at the scene looked like. In another case of rotten luck, it’d be another forty years before the first photograph in human history would be taken, meaning he had an extremely lengthy research process ahead of him. This was aided, however, by the coincidentally brotastic relationship Trumbull had with Thomas Jefferson. Jefferson, best known as the Founding Father who gave us the first vanilla ice-cream recipe in America (Google it), invited Trumbull to his Paris château on multiple occasions. While Jefferson had also not attended the battle, he did give Trumbull the opportunity to sit with the numerous individuals including French officers who were present at the surrender to take portraits of their faces. Having completed his study abroad tour for the painting, Trumbull continued working for the next seventeen years making it either the best artistic work in the universe or an example of extreme procrastination. In 1817 he showed the small, still incomplete version of The Surrender of Lord Cornwallis to the public in Washington. Following his exhibition, the United States commissioned Trumbull to complete four large paintings depicting different scenes of the revolution to be hung in the United States Capitol rotunda, including a much larger version of the Surrender at Yorktown. He completed this painting and three others (which were each seven times larger than his original 20x30 inch) just three years later in 1820. The piece depicts an extremely voyeuristic George Washington sitting on a dark horse gleefully watching General Benjamin Lincoln accepting surrender from the British. Further, history buffs may have noticed the name of this painting is actually a misnomer. Lord Cornwallis does not appear in the painting as he never showed up to the surrender, citing illness. Suuuure. Nevertheless, Trumbull included his name in the title of the painting in a move which I celebrate as a fantastic middle-finger to a very sore loser. 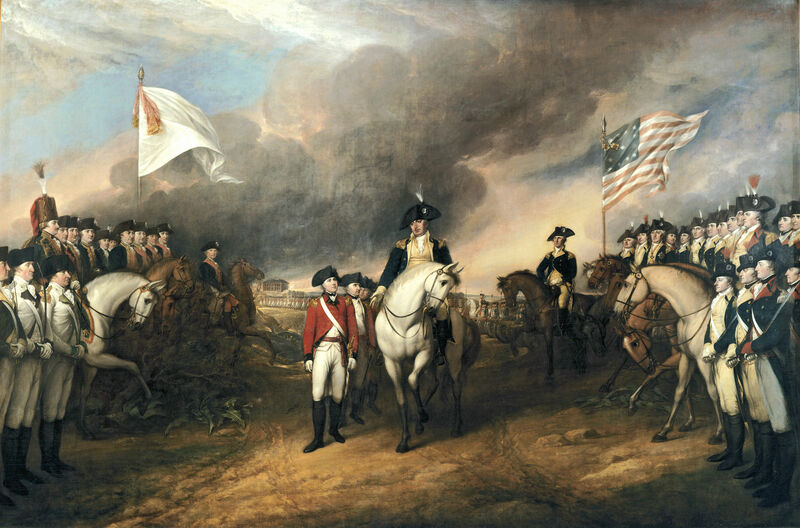 The Surrender of Lord Cornwallis is an oil painting by John Trumbull. The painting was completed in 1820, and hangs in the rotunda of the United States Capitol in Washington, D. C.
The painting depicts the surrender of British Lieutenant General Charles, Earl Cornwallis at Yorktown, Virginia on October 19, 1781, ending the Siege of Yorktown, and virtually guaranteeing American independence. Included in the depiction are many leaders of the American troops that took part in the siege. Check out the full Wikipedia article about Surrender of Lord Cornwallis.